Our goal is to help kids make their own discoveries and their first steps on the path of knowledge, as to avoid “overstuffed” knowledge. The enriched knowledge – is the one that is acquired in the process of immediate experiences, impressions, observations, practical action. Only personal experience of the child helps him to grow and develop. Therefore, our task – to create conditions for the baby and developing environment in which it would bring out the interest in outside world full of discoveries. The child develops quicker with the help of the parents. Therefore, we interact with many parents. This program contains a synthesis of the best practices of the early development of children – Glenn Doman method, Cecile Lupan, Maria Montessori, Masaru Ibuka, Nikitin and Zaitsev. Children learn about outside world faster with the help of their parent. The classes mainly concentrate on providing practical information about the world around us including using all the senses: eyes, ears, tongue, nose, and touch. Tongue- is the main muscle of the speech organs which requires lots of movement and exercise. Thus, such exercises help develop a clear speech so others can understand you better. Particular attention is paid to the development of fine motor skills, as it has a beneficial effect on the development of a child’s speech. 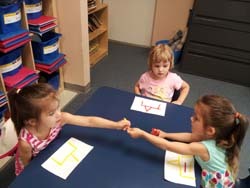 Hand massage, rhyming fingerplays help develop good listening skills and the ability to capture the rhythm of speech. Supervision of a parent is highly recommended during such activities which can be done at home. Children are physically engaged in a variety of outdoor games. Through music, children learn how to pay attention to the emotional tone of a certain melody. Children will love to choose variety instruments to play with, as well as musical toys.